Texting My Pancreas: #GiveAllTheThings: DCAF Gear. Its a great way to represent and like Elizabeth said a great conversation starter to educate people on diabetes, in my case T1. I wear blue for everyone living with diabetes- whether they have diabetes or are a caregiver or a loved one. I wear blue for people who don't have access to insulin or other medical supplies they need. But mostly, I wear blue for my daughter. I wear blue so people might ask why and I can start the conversation about diabetes. A pin would do even better! What you can win: Five "Blue Fridays" buttons, going to five lucky winners! 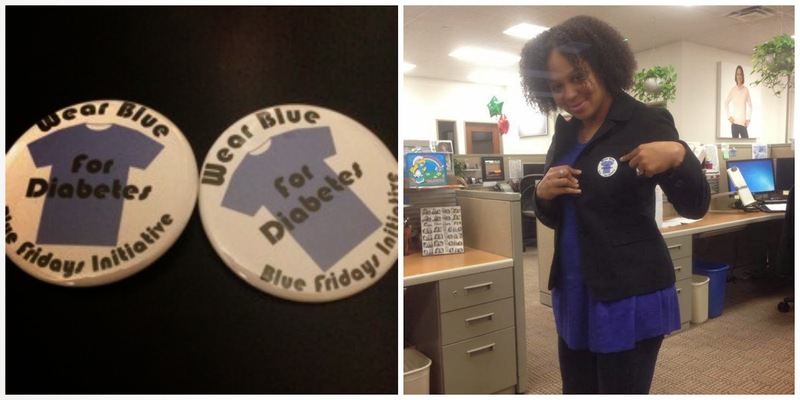 Why you want this: "The Blue Fridays Initiative was created by Cherise Shockley in 2010 (and is supported by the Diabetes Community Advocacy Foundation) to raise awareness for diabetes and World Diabetes Day. Wearing something blue every Friday can be a little tricky and expensive, so DCAF found a quick and easy solution by creating a Blue Fridays Initiative button! The DCAF team will send five people five blue Fridays to help you and your loved ones raise awareness for diabetes." Rules: This contest ends tonight at midnight CST, and is open to U.S. addresses only. #GiveAllTheThings contests are intended for people with diabetes (or their caregivers) only. Since the Rafflecopter widget requires you to share an email address, I'll be emailing the winner (as well as announcing them through an update on this post) on Friday - you'll need to respond to me by Sunday evening (let's say 7:00 pm CST) with your shipping address in order to claim your prize. If I don't hear from you, I'll pick a new winner. I wear blue because we need a cure ASAP and wearing blue brings awareness.